I love the colors and sounds of fall. The leaves on the trees go from green to yellows, reds and orange and they make a satisfying crunch under your feet. The weather begins to cool and we start thinking of snuggly woolens, warm fires and hot drinks. Celebrate fall with this beautiful Leaf Cuff Hat. 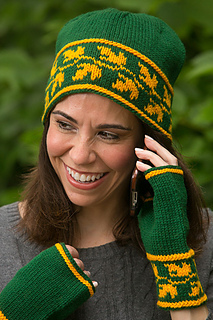 The Leaf Cuff Hat begins with an Old Norwegian cast-on method and features colored leaf motifs along the brim. A Double Purl stitch mimics the cast-on at the top of the cuff and edges of the brim on the hat.